Mary Holm has been on my radar for a long time, she was possibly the first woman I heard speak with authority on how to handle money and has continued to be a great role model. Many times I’ve wished she was my auntie, oh the things I would have learned about how to handle money much much earlier in life! The front page of her new book says she is “New Zealand’s Most Trusted Money Expert”. I bet that bold claim caused the publishers angst, but I think it’s true. I was sent a copy of her new book “Rich Enough? A laid-back guide for every Kiwi” back in December, plus a copy to GIVEAWAY to a lucky someone (entry details below), so let me tell you a little bit about it. For those who don’t know who Mary Holm is, she has an MBA in finance, has lectured on the topic at Auckland Uni and amongst other things is a director of the FMA and Financial Services Complaints Ltd. She has been writing about personal finance for many years and you may have read her content in the likes of the Weekend Herald, Dom Post, Christchurch Press and Waikato Times. She has written a number of books such as The Complete KiwiSaver Guide, Get Rich Slow and one I refer to when I need to research something: Upside, Downside: A Guide to Risk for Savers and Investors which she wrote for the Reserve Bank of New Zealand. You may have also heard her on her fortnightly slot “Your Money with Mary Holm” on RNZ, apparently one of it’s most popular segments! I always feel for her when I listen because she must sometimes feel like a stuck record having to explain to people just why they SHOULD sign up to KiwiSaver! But, she is a relentless educator and patiently keeps encouraging us to make great financial decisions, because even though she has to keep repeating herself, someone may be hearing this message for the very first time and her guidance may prompt that one person to actually make some good financial choices. I’m not going to lie to you, I love Mary and trust her advice, but I did fall asleep reading this book I’m afraid. Sometimes personal finance can be really dull. Who knew! As I sit writing this, the review into Australian owned banks is swirling around in the headlines. Its pretty clear that we are each being actively marketed to and sold products that might not necessarily fit OUR exact needs, but will certainly boost the enormous profits of the company that is selling them. No wonder people have ended up with all of their banking and insurance with the ANZ bank, for example, because they (or insurance brokers or AFA’s) are certainly not shy about advising you and me to “USE US FOR EVERYTHING”. That’s why I wish that this book, instead of teaching us how to avoid the rip off merchants, actually more openly offered suggestions of exactly WHICH rip off merchants we should avoid and tell us instead which company is actually offering a great option for banking, insurance, KiwiSaver etc. I think that is the beauty of Scott Pape and his book The Barefoot Investor, he straight out says “use company X and NOT company Y because they are a bunch of crooks”. I know he has copped a lot of flak for this but the everyday investor is thankful for sure. He did the research so they didn’t have to. The post I wrote where I listed the NZ equivalents of all the Australian services he refers to in his book remains my most popular post. I think that Kiwi’s are wanting to become better with money, but don’t have the time or desire to learn, would really welcome a straight up suggestion of who to go with and they just want an expert to say “do this and you will be fine”. In the absence of that happening, the bank fills that space. If Mary Holm made a suggestion, I would trust her advice and I would follow it. Therefore, if you are hoping to buy this book to encourage your sister, mother, flatmate or friend to stop being an over consumer who thinks only for today and you want to teach them how to invest. Don’t. You will bore them silly and you won’t be doing the PF cause any favours. 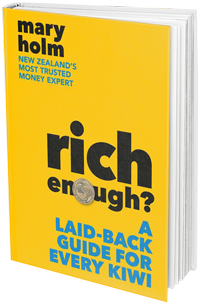 But if YOU have an interest in money and want to skill yourself up on a wide variety of ways to be better with it, then this book will be an excellent money guide. This is an excellent reference book and that is what I’m using it for, to find specific advice. For example, if you are wondering what the best way to invest a lump sum is, you can flick to that section and get a really good understanding of the pros and cons, but it’s not going to tell you who to invest that lump sum with. I’m QUITE picky about what PF books I keep on my shelf, but this one will be a keeper for me. The BOOK GIVEAWAY of RICH ENOUGH by Mary Holm was a great success and congratulations to our winner who won a copy of the book. Thank you to all my subscribers who entered. If you want to read it now you can try your local library or you can purchase a copy via my link to Mighty Ape.